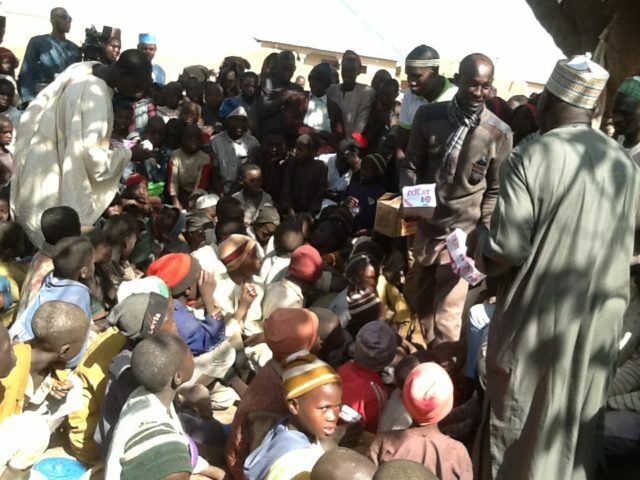 No fewer than 300 Almajiris benefited from a Medical Outreach provided by the Islamic Medical Association of Nigeria (IMAN), Ahmadu Bello University Teaching Hospital (ABUTH), Zaria on Sunday. The News Agency of Nigeria (NAN), reports that apart from free medical services, the association also donated food, cardigans and other basic items to the Almajiris at Hayin Katsinawa, Shika in Giwa Local Government, Kaduna State. NAN also reports that the exercise was one of the series of activities lined-up for the association’s Annual General Meeting (AGM), and Health Week for 2019. Speaking during the exercise, the IMAN Secretary General and Director of Programmes, Dr Muhammad Mustapha-Yakubu charged the beneficiaries to be orderly. Muhammad-Yakubu said: “We are here for the second day of our programme, Free Medical Outreach, which was kicked-off at Wucicciri in Zaria Local Government yesterday. “We want to treat the Almajiris having issues relating to malaria, skin diseases, hair problem, cough and worms among others. “We are also going to present lectures on hygiene, truthfulness and skills acquisition. We have also designed a skills acquisition programmes for Almajiris towards making them self reliant,” he said. According to him, the skills acquisition programme, tagged ‘Almajii Rehabilitation and Empowerment Scheme’, is fully funded by IMAN. “This is introduced to give Almajiris a sense of hope and to become useful to themselves and to the society in general,” he said. In a lecture entitled: ‘Good Behaviors and Truthfulness’, Malam Musa Muhammad, the Na’ibul Imam of ABUTH Central Mosque, described Qur’anic school as the best place to be. He said: “Prophet Muhammad (SAW), said ‘whoever takes a path for seeking knowledge, Almighty Allah will ease his path to Aljanna (paradise). “Remember, those who gathered to learn Qur’an, Almighty Allah will bless them with humility on earth and in the hereafter, they will be rewarded with the highest reward of paradise. He encouraged them to remain steadfast to learning the Qur’an, exhibit good moral values, always speak the truth and avoid anything that would tarnish the image of Islam. Muhammad said Qur’an always taught good conducts, hence the need for those learning the Holy Book to shun all forms of social vices. Malam Muktar Musa in his lecture on hygiene tasked the Almajiris on frequent hand washing, insisting that nobody amongst them should eat anything without washing his hands. Musa observed that whoever holds Qur’an “is better and above all”, hence the need for them to imbibe the habit of hygienic lifestyle for sound living. He encouraged those with health problems not to feel shy as the association had made adequate provision to take care of their health needs. Responding, the overseer of the Almajiri school, Aramma Abubakar Dauda appreciated IMAN for the gesture and urged them not to relent in their quest to improve not only the health of the less privileged but also their economic well-being. He said the school was ready to partner with the association to enable the Alamjiris pursue their Islamic education and become self reliant. The News Agency of Nigeria (NAN), reports that IMAN ABUTH consist of Surgeons, Gynecologists, Ophthalmologists, Peri-op Nurses, Ophthalmic Nurses, Anesthetists, Pharmacists and Assistants among others. NAN also reports that the Free Medical Outreach Week would feature surgical operations on different illnesses and ophthalmic operations on benefiting patients.